Your guide to beating Junkenstein's Revenge on Hard, Expert and Legendary. 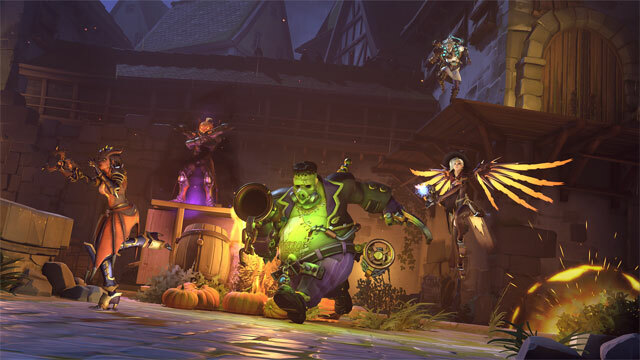 Junkenstein’s Revenge is a co-op PvE mode in Overwatch that is only available during the Halloween Terror event. The game is set in a castle courtyard that resembles a Halloween-themed Echenwalde. 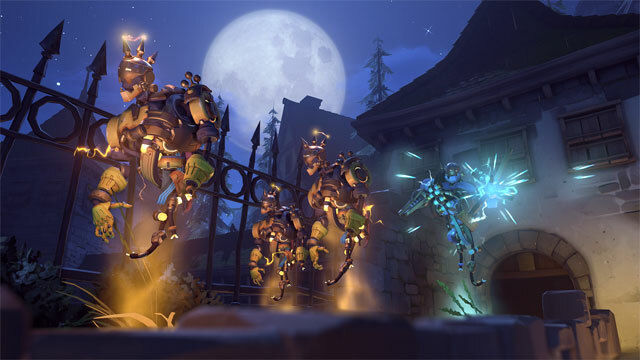 Players form a team of four heroes – Soldier: 76, Hanzo, McCree, and Ana, and then battle together to defend the castle’s gate against the onslaught of Dr. Junkenstein’s cohorts and mechanical minions. 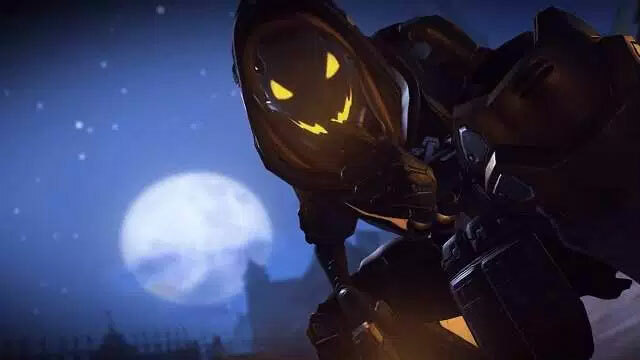 In the first Halloween Terror event, only three difficulties were available – Easy, Normal, and Hard. 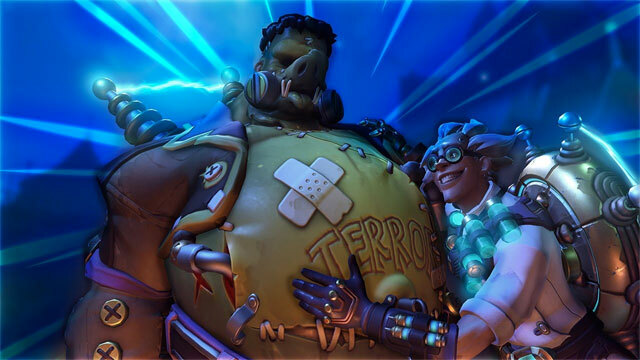 Halloween Terror 2017 is more difficult all around, due to Roadhog’s changes and the addition of Symmetra as a new boss enemy. On top of that, Expert and Legendary difficulties have been added to the game. Most players will be able to beat Junkenstein’s Revenge on the normal difficulty setting, but harder settings can prove extremely challenging. However, proper planning and strategy can provide the edge you need to succeed. Success in Junkrat’s Revenge depends on the team’s ability to juggle multiple priorities. The team needs to keep the Zomnics and Shock-Tires from reaching the gate, stay alive, and take down the boss enemies, all at once. It’s impossible for everyone to focus on everything at once, so it’s crucial that the team divide the responsibilities according to each hero’s strengths. Soldier: 76: Soldier: 76 is a high-damage character, but he’s not as focused as Hanzo and McCree. He can take down bosses in lower difficulties, but he is much more useful for crowd control – focusing fire on the small enemies, making sure they don’t make it to the door. Tactical Visor is especially useful in a pinch, allowing Soldier to protect the gate on his own while the other heroes deal with the bosses. McCree: McCree is the chief boss-killer in Junkenstein’s Revenge. His ultimate ability Deadeye can deal significant damage to multiple boss enemies at once. If he combines Deadeye with Ana’s Nanoboost, he can instantly kill bosses (with the exception of Roadhog). This is crucial in the higher difficulties, when spending too much time fighting bosses can allow the team to be overrun with Zomnics. 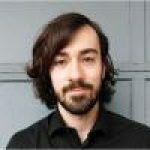 Hanzo: Hanzo’s bow does even more damage than McCree’s revolver, but it doesn’t shoot as quickly, and his ult isn’t as powerful in this game mode. However, his scatter arrows can be useful against bosses, and his arrows can kill Zomnics in single headshots. Provided the player has good aim, Hanzo can be very useful for crowd control. His wall-climbing ability also makes him the most mobile hero in this mode, so he can rush to provide backup wherever he is needed. Ana: Ana is crucial to the team’s success, as she is the only healer in this mode. Her primary role is to keep the team alive. In higher difficulties, this requires some preventive measures, in addition to healing after damage has been done. Using the sleep dart on bosses can buy the team some much needed time, and the Nanoboost/Deadeye combo is indispensable. When the team is mired in a swarm of Zomnics and bosses, it’s hard to decide what targets to focus on. As mentioned previously, Soldier: 76’s priority should be to focus on the Zomnics, and protect the door. McCree (with Ana’s support) should focus on the bosses. Hanzo can back up either McCree or Soldier, as needed. But what about the game’s finale, when the team needs to deal with multiple bosses at once? The first reaction might be to drop everything and focus on Mercy so that she can’t heal the other bosses. However, this isn’t always the best move. McCree and Ana should, as always, open up with the Deadeye/Nanoboost combo. The rampart on the left of the map is an excellent vantage point, providing a clear shot at all of the bosses at once, along with the Zomnic horde. Ana should consider who she wants to use the sleep dart on during the final phase. Mercy is frequently a poor choice, because she’s a more difficult target to hit, and because Deadeye is likely to kill her instantly anyway. Instead, consider targeting the Roadhog. Hog does the most damage, and taking him out of play early is a huge step toward keeping your team alive. Soldier should focus on taking out Zomnics, as always, only firing on the bosses if the door is safe. Sparing a few bullets to take out Mercy can be a worthwhile move, if she survives McCree’s Deadeye. The same goes for Junkrat, as he is capable of doing a lot of damage to the team. Finally, Hanzo’s ultimate can be used effectively in two different ways. If Deadeye fails to kill Junkrat, the spread of Hanzo’s Dragonstrike is wide enough that Junkrat can’t move out of the way on his platform, so it will finish him off easily. Or, if Soldier can’t handle all of the Zomnics, the Dragonstrike can be used to clear the center lane while also damaging any bosses in Hanzo’s path. Killing enemies as quickly as possible is crucial, so McCree, Soldier, and Hanzo all need to aim for their enemies’ heads. Zomnics can’t attack heroes, but Zombardiers can. Focus on the Zombardiers first, as survival is the team’s first priority. During the slower waves, communicate with your team and make sure everyone does enough damage to fully charge their ults. As Ana, prioritize healing. If you have time to fire at Zomnics, be frugal with your bullets. The poison damage will finish them off, so don’t use more bullets than you need. Don’t waste Dragonstrike on Reaper – he’s just use wraith form to escape unharmed. Take advantage of Ana’s sleep darts. If Roadhog is asleep, don’t wake him up! You need all the time you can get. When the narrator announces the appearance of a boss, nanoboost McCree instantly, and use Deadeye. The ult will continue locking in on targets while the animation plays, giving you a few seconds’ head-start. Don’t use any other ults until the voice lines have finished, because the ult will run down during the animation, and you won’t get your full use out of it. Don’t try to solo-queue. You might get lucky and end up with a great team, but it’s not likely. Play with people you know, or gather a team as you play. Either way, stick with them, and learn to work as a group. Teamwork is the most crucial element of success.